Hodgdon T7 Magnum pellet box. Photo courtesy of Randy Wakeman. When it comes to the propellants marketed for muzzleloaders, to say that I have invested (spelled wasted) many hundreds of hours would be a tremendous understatement. New attempts have appeared regularly; I have done my best to cover all of them as best as I am able. Since then, not a great deal has changed. Shockey’s Gold and American Pioneer remain horribly erratic in velocity; perhaps the worst performing group of propellants introduced in the last decade. The Black Mag3 that did so well for me is unavailable; MagKor does not return e-mails or phone calls. The curse of unreliable propellants and / or unreliable companies offering them continues to plague muzzleloading. In last year’s round-up, I finished by saying “So, for now, Triple Se7en remains the available solution. If you are in the mood to try a new powder, particularly if your breechplug is extremely filthy, or if you find T7 hard to ignite, I'd say Black Mag 3 is worth your time to investigate.” Now, there is no Black Mag3 to investigate as far as I can determine. Hodgdon Powder Company excels at distribution; they are able to make their products available solutions: an unavailable solution being no solution at all. 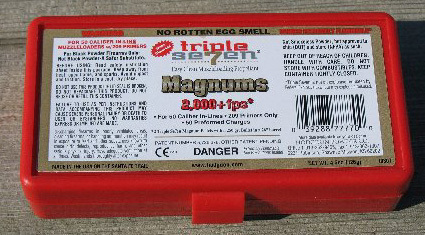 That brings us to the latest offering from Hodgdon the “Triple Se7en Magnum” pellets. 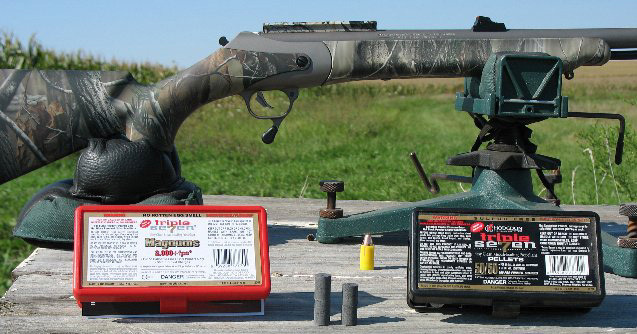 When I originally tested pre-production Triple Se7en pellets in a wide variety of muzzleloaders, the velocities were clearly better without exception to the then-standard Pyrodex pellets. By the time retail-packed T7 pellets appeared, though, the 2 pellet performance of T7 was virtually identical to 2 pellet Pyrodex pellet performance. Hodgdon likely did the wise thing, as it has never been Hodgdon allowing or suggesting 3 pellet or 4 pellet loads—but naturally, various manufacturers have promoted just that, and still do. “TRIPLE SEVEN MAGNUMSgive you the capibility to make a longer shot and deliver more energy to the target. If you've shot Triple Se7en products before, you can expect the same easy clean up with no rotten egg smell. Using two Magnums you can achieve an additional 200-250 feet per second (fps). This normally results in muzzle velocities of approximately 2,000 fps. That is the exact quote from Hodgdon’s website, including the misspelling of “capability.” Do the new pellets do as promised? In a word, yes. The velocities are with “250 grain bullets” and “28 inch barrels.” My testing was with a T/C Triumph, with a usable barrel length significantly less than 28 inches. Shooting at 5 feet from the muzzle with .452 Hornady 250 grain SST’s and Barnes 245 grain Spitfires, my average velocity clocked 2039 feet per second. To offer a bit of perspective, two “50 grain volumetric” equivalent Pyrodex or standard Triple Se7en pellets more often than not get you into the mid-1800 fps range with 250 grain class bullets. Three Pyrodex pellets (contingent on individual gun, components, and ambient conditions) often get you 2150 – 2200 fps with 250 grain class projectiles. Use of two “Triple Se7en Magnum” pellets gets you right in the middle between two and three Pyrodex (or T7) pellets from a MV perspective. As clearly as I can state it, T7 Magnum pellets will very likely net you more than 100 fps at the muzzle vs. standard two pellet loads and also fall short of standard three pellet loads by a similar amount. Hodgdon T7 pellets and T/C Triumph rifle. Photo courtesy of Randy Wakeman. I personally would have complete confidence using these pellets in Thompson, Knight, NEF / H&R, and Savage inline muzzleloaders. I absolutely would NOT use them in Traditions, CVA, or Remington imported by Traditions inline muzzleloaders under any circumstances, nor would I expose myself to the added risk of using three Pyrodex or standard T7 pellets in these guns. Where the added velocity comes from is obvious: a pair of standard 50/50 T7 pellets weighs about 62 grains on my Lyman electronic scale. A pair of T7 Magnum pellets weighs about 75 grains. We are burning about 20% more stuff with the T7 Magnum pellets; that muzzle velocity goes up should surprise no one. So, I’ll finish by offering up my own feelings on the matter: if I had to hunt with pellets, two Triple Se7en Magnum pellets is what I’d opt for. Hodgdon makes the only pellets that work, anyway. If I wanted to hunt with a new propellant touted as a “blackpowder sub”—I personally would use weighed charges of T7 FFg loose powder. Weighed charges remain the only way to properly work up a load for an individual rifle and the most accurate. T7 Magnum pellets are another fine product from Hodgdon. They work just as described, and just as promised. I’m glad for that; there far too many products that absolutely do not. Hodgdon did a very good job with this new release.